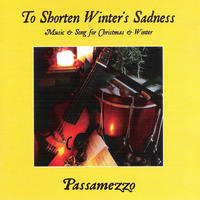 Passamezzo: 16th and 17th century music and song for christmas and winter. Passamezzo was founded in 2001 and is a dynamic ensemble dedicated to the performance of Early Music in an accessible, educational and historically informed context. 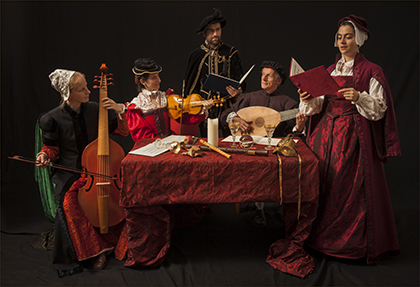 The ensemble specialise in English Elizabethan and Jacobean repertoire, the masque remaining an important part of their programming, and concerts have a distinct theatrical air created by costume, readings and presentation. The ensemble delights in all aspects of musical life, from the intimacy of the lute song, to the brash raucousness of the broadside ballad, from the sacred part song, to the profane insanity of bedlamite mad songs. The programmes are carefully researched with music frequently taken from manuscript sources. It is this range of material and overall spectacle, combined with the informative and accessible manner of their presentation, that makes Passamezzo such an engaging group. A passamezzo was a particular ground, or series of chords, popular throughout the sixteenth and seventeenth centuries. It might take the form of a simple song or dance ("Greensleeves" is the most well known example of this), but could also become a complex courtly dance or exhibition piece, with virtuosic and showy divisions played upon it. Passamezzo have played in a number of venues including the British Museum; the Victoria and Albert Museum; Shakespeare's Globe Theatre; Hampton Court Palace and in theatres, concert halls, stately homes, churches, palaces and ruins throughout England. Television and Radio credits include: BBC Restoration and Howard Goodall's The Truth about Carols (BBC2); Big Brother (Channel 4); Frost Fair; King Lear and Boxing Day, (Radio 4); Vic Reeves' Rogues (Discovery); Early Music for the Holidays; Christmas Carols, Chant and Legend (Harmonia Early Music/PRX). Passamezzo also work with Moroccan Sufi musicians, "Association Mogador Chant et Musique Soufie", as part of the intercultural project "From Shore to Shore" performing in England and Morocco. Eleanor started her vocal studies at the junior department of the Royal Academy of Music where she also studied cello. She began singing in Cambridge when she won a choral award at Clare College, where she read theology. Currently she sings with the choir of Sidney Sussex College, Cambridge, under David Skinner. She has also sung in the Choir of London in collaboration with the RPO. Recent solo work includes: Miles in Britten's Turn of the Screw (with Seastar Opera); soprano arias in the St John Passion at St John's Cambridge; and at Snape Maltings with James Bowman. Now following her passion for early music, Eleanor sang with Alamire on their 2010 Taverner recording. She features as a soloist on a recently released recording of Weelkes with the viol consort Fretwork. Eleanor also sings with the Cambridge consort The Lady Frances Singers, whose first recording is currently in production. Chris took up the lute at the age of 19, and for the last 15 years has been Secretary of the Lute Society, and editor of Lute News; he has also edited and published collections of lute songs from original manuscript sources, and written academic papers on 16th century music. Has appeared on the Radio 3 In Tune programme, on the Radio 4 Today programme, and as a musician in the feature films Shakespeare in Love, and Snow White and the Hunter, in Reeves' Rogues: Blackbeard on the Discovery Channel, in ITV's Have I been here before? and has played, briefly, on BBC's The Weakest Link, Channel 4's Stephen Hawking and the Theory of Everything, Big Brother and University Challenge Professionals. Alison Kinder read music at Oxford and was then given a scholarship by Trinity College of Music where she studied viol with Alison Crum, being awarded the college's Silver Medal for Early Music Studies. She plays regularly with several ensembles including costumed group Passamezzo, Chelys consort of viols, Baroque ensemble Saltarello and the new Renaissance ensemble Philomel. A busy freelance concert schedule includes working with some of the leading performers and ensembles in the Early Music world, a recent highlight being with the Rose Consort at the BBC Proms. A keen teacher of both children and adults, Alison is a tutor on a number of Early Music courses, including Rondo Viol Academy, the Easter Early Music Course and Norvis. She teaches viol and violin both privately and in schools, and directs the Warwickshire Youth Waits, a Renaissance band for young players which includes everything from recorders and viols to crumhorns, shawms, rebecs and more! Alison has had a number of educational books published with colleague and fellow viol player Jacqui Robertson-Wade. They include group teaching material for viols and recorders, and a children's music theory series called The Notehouse People. She recently finished a modern edition of the divisions from Christopher Simpson's Division Viol treatise. Tamsin studied violin at the Florence Conservatoire and read Classics and Italian at Oxford. She has written, arranged, directed and played music for a number of theatre productions including: Tempe Restored (Banqueting House); Play of the Weather; Arraygnment of Paris (Hampton Court Palace); Lilies on the Land (National Tour); Entertaining Morocco (Theatro Technis); The Real Hans Sachs (Linbury Studio, ROH); The City Wives Confederacy (Greenwich Playhouse); The Roaring Girl; The Jew of Malta; Dr Faustus (Rose Theatre); Spring's Glorie; Old Summer's Wakes and Revels (Shakespeare's Globe). Tamsin has published a number of music books with Rondo Publishing, and is a member of the Lions part theatre company. She plays and teaches historical music at Hampton Court Palace and is currently working as Musical Director on an AHRC funded project on the Ben Jonson's Carolingian masque Love's Welcome. Jack is a musician and actor. He trained classically as a pianist and singer in Cambridge, taking a BA (Hons) Music Degree and completed an Acting MA at Mountview. He plays guitars, keyboards and harmonicas, writing and performing as a singer/songwriter and also plays the accordion and a variety of percussion instruments. Jack has toured as a singer to Australia and Italy and filmed in Kathmandu and Hong Kong. As a Music Director and composer Jack has worked with Oddsocks, Creation Theatre Company, Sixth Sense Theatre for Young People, and is about to start at the Salisbury Playhouse. Acting Theatre credits include: A Midsummer Night's Dream (Mumford Theatre), It's Only Make Believe (Upstairs at the Gatehouse), Murder in the Cathedral (Iris Theatre Company), The Owl and the Pussycat went to see... (Brentwood Theatre), Much Ado About Nothing (Oddsocks), Beauty and the Beast (Creation), Shakespeare's Clown (Strange Bedfellows), A Family Cookbook (Sixth Sense). Television credits include: The Lost Worlds (BBC Television) and Banged Up Abroad (Channel FIVE). Passamezzo lives in London, England. Tagged as: Classical, Renaissance, Classical Singing, Christmas, Composer: Anthony Holborne, Composer: Orlando Gibbons, Composer: Thomas Campion, Composer: William Byrd, Lute, Recorder, Violin.